"If the author, Susan B. Martinez, Ph.D., is correct, an 890-page book called "Oahspe" is the best kept secret in the world. But it is not supposed to be a secret. It was intended to be as well known as the Bible and provide answers to humankind on all life's mysteries, including the history of the planet, the history of the human race, the fate of man, and countless other matters pertaining to the nature of man and the purpose of life." (about 60% down from top of page). The Key to understanding anything you read is to take it one word and one sentence at a time. If you come to a word you don't understand then research the word until you understand it, then go back and re-read the sentence again. I have made the word research easier for you by providing definitions for many strange words in Oahspe and on my website. Scientists use this formula, called the Drake equation, to explore the chance we'll make contact with intelligent aliens. In 1961, Frank Drake wrote down what is now called the Drake Equation, which is frequently used to help guide thinking about extraterrestrial life. When Drake wrote down his equation, very little was known about any of these probabilities. They were all pretty much guesses. A lot has changed in the last half-century and we now have a much better understanding of some of these numbers. So, what do we know for sure? While the universe is vast, let's restrict our investigation to only our own Milky Way, as other galaxies are very far away and the idea of traveling between them is even more daunting than interstellar travel. So, I'll only talk about our celestial neighbors. The Milky Way has about a hundred billion stars in it, with some estimates four times larger than that. In 2009, NASA launched the Kepler spacecraft to search for planets around distant stars. What the Kepler mission found was nothing short of astounding. We know that most stars have planets (over 80%). About a quarter of those planetary systems have a planet at a distance from the star that would allow for liquid water. And, of those, 10% to 20% of the time those planets are around the same size as Earth. Combining those numbers, we can estimate with some accuracy that the number of possibly habitable planets in our galaxy is in the neighborhood of 2 billion. While there is some uncertainty in this estimate, it is relatively firm. Taken in aggregate, it does seem that extraterrestrial life should exist and there may be planets where our cosmic cousins also look at the sky and dream. 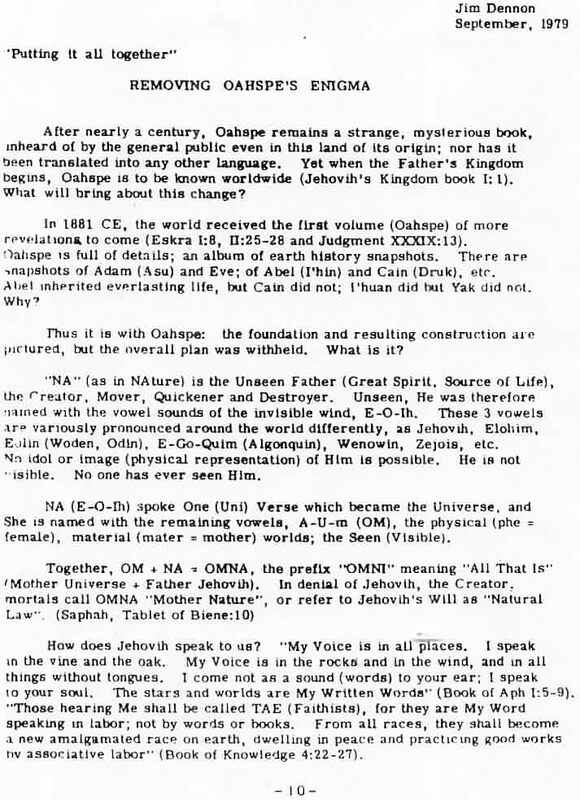 OAHSPE BOOK OF SAPHAH M'HAK:25 says angels [men] once lived on other corporeal [physical] worlds. 22. Hoe'ghi...of the corporeal star Alanx. 9. Lika was sprung from the corporeal star Atos, which traversed the roads, Yatas-koowen, of the south circuit of Thoese, the vortex of another far-off sun,..
5...Che'sin...brought forth from the star, Indr. 2...the spirits of darkness rescued from Unhowitchata, a prolific world, bringing forth imperfect human souls too abundantly for the quality. Here in 1881 Oahspe mentions 13 extra-solar planets (that I have found so far) that had human (genus Homo) life (water, oxygen, nitrogen, carbon, proteins, and DNA, etc...) on them at one time. 1992 was when scientist first discovered an extra-solar planet. 15. ..I have seen many corporeal worlds arrive at the kosmon era. 18. On all the planetary worlds it is ever the same; certain four false Gods rise up to possess the corporeal worlds and her heavens. It is because of these "repeating patterns" (fractals) throughout the universe that I know there is human life on other planets in other solar-systems and galaxies just as Oahspe described in 1881. Scientists have discovered a planet which could have the most Earth-like environment ever found - raising a 'very compelling case' for life there. With our planet rated at 1.0 on the Earth Compatibility Index, Gliese 581g, found in the Libra constellation, scored 0.89, ahead of Mars on 0.7. Experts report that there are already more than 700 exoplanets discovered, but only a few are in the habitable zone. An infrared image of the HR 8799 system. The central blob is noise left over after light from the star has been largely removed. The three known planets can be seen: HR 8799d (bottom), HR 8799c (upper right), and HR 8799b (upper left). Here Oahspe describes an etherean arc containing 100 stars or star systems containing many extra-solar planets larger than the earth (most extra-solar planets discovered so far are larger than the earth), which also means some of the extrasolar planets were/are earth-sized or smaller. Most known exoplanets are giant planets believed to resemble Jupiter or Neptune, but this reflects a sampling bias, as massive planets are more easily observed. Some relatively lightweight exoplanets, only a few times more massive than Earth (now known by the term Super-Earth), are known as well; statistical studies now indicate that they actually outnumber giant planets while recent discoveries have included Earth-sized and smaller planets and a handful that appear to exhibit other Earth-like properties. SYDNEY: Two Earth-sized planets orbiting a Sun-like star have been discovered using observations from the planet-hunting Kepler spacecraft. A new study, published in Nature today, reports the detection of the smallest extrasolar planets (planets outside our Solar System) discovered so far, orbiting the Sun-like star Kepler-20. Previous research has confirmed that Kepler-20, which is located in the constellation Lyra about 1000 light years away, also hosts three larger transiting planets. It’s hoped that the discovery of these planets could help scientists in the future to find more small, and possibly habitable, extrasolar planets. The first earth-sized extrasolar planets were discovered in 2011, 130 years AFTER Oahspe plainly indicated the existence of earth-sized extrasolar planets, thus confirming again what was written in Oahspe. European astronomers say that just outside our solar system they've found a planet that's the closest you can get to Earth in location and size. The astronomers who found it say it's likely there are other planets circling the same star, a little farther away where it may be cool enough for water and life. And those planets might fit the not-too-hot, not-too-cold description sometimes call the Goldilocks Zone. That means that in the star system Alpha Centauri B, a just-right planet could be closer than astronomers had once imagined. But the wow factor of finding such a planet so close has some astronomers already talking about how to speed up a 25 trillion-mile rocket trip there. Scientists have already started pressuring NASA and the European Space Agency to come up with missions to send something out that way to get a look at least. ...Geoff Marcy of the University of California Berkeley, gushed even more about the scientific significance. "This is an historic discovery," he wrote in an email. "There could well be an Earth-size planet in that Goldilocks sweet spot, not too cold and not too hot, making Alpha Centauri a compelling target to search for intelligent life." Harvard planet-hunter David Charbonneau and others used the same word to describe the discovery: "Wow." The research was released online Tuesday in the journal Nature. Alpha Centauri B and another star, Alpha Centauri A...Proxima Centauri, the closest star to Earth besides the sun, may be related to this binary system. Its proximity is a motivator for sending probes, and even astronauts, to a different star system. "I think the reality of a planet around the nearest star and the promise of more is a game changer,” she said in an e-mail. The significance of this plate shows that there are other phalanxes (star systems) with planets in proximity (nearest) of our own solar system. Here Oahspe shows the nearest star systems with planets orbiting. Until only recently in 2012 have any planets been discovered in other solar systems in close proximity (nearest) to our Solar system, only a few (4.3) light years away. The first extra-solar planet discovered was located 1000 light years from the Sun. The discovery of the nearby extra-solar planet only a few light years away came 131 years AFTER Oahspe was typed. October 17, 2012 brought the announcement of the discovery of a planet, Alpha Centauri Bb, orbiting a star in the star system closest to Earth, Alpha Centauri. It is an Earth-size planet, but not in the habitable zone within which liquid water can exist. 24 hours is just the right length of day for human life. Time is based on the circle, rotation of the earth determines length of days and nights. Is 24 hours rotational period of a planet the right astronomical signature for human life? Extrasolar planets rotational periods or rotation periods of exoplanet. Instead of astronomers looking for planets that are the right distance from a central sun or star, the right signature for human life would be it's rotational period of 24 hours. 8 hours sleep, 8 hours work, 8 hours free time. Day divided into 1/3rds 2/3 and 3/3/. Mars use to have a rotational period like ours 24 thousand years ago. Scientists think Mars may have had life in the past, maybe human life? It seems that a rotational period of of 10 hours like Jupiter would not be enough time in one day, because man needs 8 hours sleep, and 2 hours for work and play would not be enough. It seems that 24 hours is just right, because after getting 8 hours sleep, and working for 8 hours and having 8 hours of leisure and recreational time, man gets tired and is ready to repeat the cycle again of sleep, work, and play. 24 hours seems to harmonize with his cycle of sleep, work, and recreation, 48 hours would be too much for one day. "Some ancients speculated that the stars were small holes in a black sphere through which distant light shone through. The Italian astronomer Giordano Bruno suggested that they were instead objects like our Sun, just much farther away, perhaps with their own planets and civilizations–this didn't go down too well with the Catholic Church, which had him burned at the stake in Rome on 17 February 1600." - page 25 of Our Mathematical Universe (2014) by By Max Tegmark (physics professor at MIT). Scientists are surprised to find a planet with a comet-like eccentric orbit. Oahspe says planets and stars start off as dusty comets, then evolve into stars and planets. ...the astronomy community still can’t get enough of the strange planet Fomalhaut b! First, there was controversy over whether it was a planet or a dust cloud [comet], and now they’re looking at the planet’s unusual orbit within the debris disk of its host star, Fomalhaut. The planet’s highly elliptical, 2,000-year orbit leads astronomers to suspect that there may be other planet-like bodies hiding within the debris around Fomalhaut. The unbalanced orbit of a so-called "zombie planet" in a dusty star system has astronomers struggling to explain the exoplanet's behavior. 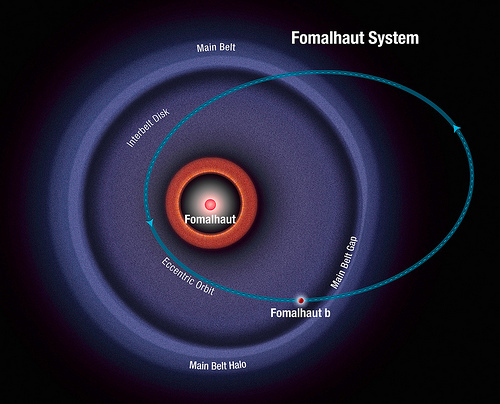 New observations of the planet Fomalhaut b by the Hubble Space Telescope revealed the oddball orbit, which has wild extremes between its closest and farthest points from the parent star and appears to cross through a vast minefield of dusty debris. "We are shocked. This is not what we expected," said study leader Paul Kalas, an astronomer with the University of California at Berkeley and the SETI Institute in Mountain View, Calif., in a statement Tuesday, Jan. 8. After first being discovered in 2008, subsequent studies suggested the planet was nothing more than a huge dust cloud. In 2012, astronomers resurrected Fomalhaut b's planet status when new observations proved there was a planetary object embedded in a free-floating dust cloud. Stranger still: The planet Fomalhaut b appears to approach with 4.6 billion miles of its star at the closest point in its orbit, then swing way out to a point about 27 billion miles away at the farthest point. Scientists call the extremes of such a planet’s path a highly eccentric orbit. All comets have highly eccentric orbits which apparently originate from a spherical distribution of cometary bodies in the 100AU to the 100,000 AU range. 5. In the case of a vortex in etherea (that is after the manner of a whirlwind on the earth), the corporeal solutions are propelled toward the centre thereof in greater density. 6. When it is sufficiently dense to manifest light, and shadow, it is called a comet, or nebula; when still more dense it is a planet. 7. When as a comet (or nebula) the m'vortex hath not attained to an orbit of its own, it is carried in the currents of the master vortex, which currents are elliptic, parabolic and hyperbolic. (See cut C, Fig. 4.) Hence the so-called eccentric travel of comets. Orbits of the Kohoutek Comet (red) and the Earth (blue), illustrating the high eccentricity of its orbit and its rapid motion when close to the Sun. Comets are also known to break up into fragments, as happened with Comet 73P/Schwassmann–Wachmann 3 starting in 1995. This breakup may be triggered by tidal gravitational forces from the Sun or a large planet, by an "explosion" of volatile material, or for other reasons not fully understood. A number of periodic comets discovered in earlier decades or previous centuries are now lost comets. The orbits of long-period comets take them far beyond the outer planets at aphelia, and the plane of their orbits need not lie near the ecliptic. Long-period comets such as Comet West and C/1999 F1 can have barycentric apoapsis distances of nearly 70,000 AU with orbital periods estimated around 6 million years. 10. Interior nebula is generally described as comets; whilst exterior nebula is usually called nebula. Nevertheless, all such solutions of corpor are of like nature, being as the beginning or as the incomplete condensation of a planet. 11. They do not all, nor half of them, ripen into planets. But their vortices are often broken and they return again into sublimated solutions, and are lost to mortal sight. These "lost" comets may have become planets outside our solar system (extrasolar planets). 3. My Son! My Son! Go to the red star, the earth. She cometh thy way; her coat is red with mortal blood! 4. Fragapatti said: The Father saith: The red star cometh this way; her coat is red with mortal blood! 6. And then they overhauled the earth's history, these Gods and Goddesses; measured her course to learn just when she would pass; and they found five years and fifty days would be her dawn of dan, her time to cross the arc of Aza. And as yet she roamed two hundred years away. 9. Fragapatti said: Autevat, my son, the All Light fell upon me, saying: My Son, go to the red star, the earth; her coat is red with mortal blood! Now, by her time, she standeth more than two hundred years beyond the boundaries of Horub. For this, I called thee and thy attendants. How long will it take thee to go thither and survey the earth and her heavens, and return hither? 10. Autevat, well trained in such matters, said: Of the earth's time, forty days. 4. But in forty days' time, or in such period as would be forty days on the earth, Autevat and his attendants, twenty thousand, with the arrow-ship of fire, returned from the earth and her heavens, speeding close to Obsod, where the marshals received them, and announced them to the Council. The earth was travelling at a speed of 200 years away from the Arc of Aza, it took only 20 days for the arrow-ship to travel to the earth from the Arc of Aza. 200 (years) x 365 (days) = 73000 days divided by 20 (days) = 73000 divided by 20 = 3650 x faster than the travel of the solar system. C) Our solar system ( Solar =’s, the sun, --, System =’s, the planets, moons, asteroids and comets) revolves around the galaxy at 885,139 kilometers per second or 550,000 miles per hour, taking 225 million years to make one rotation around the galaxy. 557638.888888 (speed of Arrow-ship) divided by 186240 (speed of light) = 2.99419506491 or almost 3 x the speed of Light. (science fiction warp speed). A concept for a real-life warp drive was suggested in 1994 by Mexican physicist Miguel Alcubierre, however subsequent calculations found that such a device would require prohibitive amounts of energy. Now physicists say that adjustments can be made to the proposed warp drive that would enable it to run on significantly less energy, potentially brining the idea back from the realm of science fiction into science. An Alcubierre warp drive would involve a football-shape spacecraft attached to a large ring encircling it. This ring, potentially made of exotic matter, would cause space-time to warp around the starship, creating a region of contracted space in front of it and expanded space behind. "There is hope," Harold "Sonny" White of NASA's Johnson Space Center said here Friday (Sept. 14) at the 100 Year Starship Symposium, a meeting to discuss the challenges of interstellar spaceflight. But recently White calculated what would happen if the shape of the ring encircling the spacecraft was adjusted into more of a rounded donut, as opposed to a flat ring. He found in that case, the warp drive could be powered by a mass about the size of a spacecraft like the Voyager 1 probe NASA launched in 1977. Furthermore, if the intensity of the space warps can be oscillated over time, the energy required is reduced even more, White found. "This ring, potentially made of exotic matter, would cause space-time to warp around the starship...Meanwhile, the starship itself would stay inside a bubble of flat space-time that wasn't being warped at all"
Oahspe's star-ships (space-ships) were surrounded by a globe or bubble of energy that was related to its power or warp drive. Oahspe's description came 113 years before the physicist Miguel Alcubierre came up with the concept. Above is from the book "Are Universes Thicker Than Blackberries? : Discourses on Gödel, Magic .." by Martin Gardner (2004). On page 108 of the above book the author makes a common mistake I have heard, he states that according to Oahspe our solar system travels in an orbit around the Milky Way galaxy that takes 4,700,000 years. This is false (and a failure to understand Oahspe), the 4,700,000 year orbit (of Cevorkum) that Oahspe speaks of is a SUB-GALACTIC ORBIT around the North Star (Polaris) not a galactic orbit around the Milky Way. And as you read below on this page you will see Newbrough accomplished much more than "not such a bad guess", but he gave an accurate number based on the unknown distance to Polaris at the time and the unknown speed of the solar system at the time (in 1881, see proof and mathematics below). What I did with the mathematics, that to my knowledge no one else has done, is I am not waiting on scientists to discover this sub-galactic orbit to see if it is mathematically valid. Oahspe gives us enough info to test if something is mathematically possible. Oahspe tells us that the center of this sub-galactic orbit is the North Star or Polaris, astronomers have measured Polaris to be 434 light-years away, right there that gives us the radius of a circle or orbit. If you know that radius of a circle you can calculate the circumference (or orbit) of a circle by the geometric formula pi x radius x 2 = circumference of a circle (or orbit). 434 (light-years away Polaris) x 3.14159 x 2 = 2726.90012 light-years circuit. Next add the speed of the solar system to the distance of 2726.90012 light-years to get time of Circuit. Solar system speed = 420,000 mph divide by 60 then divide by 60 again to get miles per second. 420,000 mph / 60 = 7,000 mpm, 7000 / 60 = 116.66 = mps Solar system speed. Speed of light (for convenience sake) = 186,282 miles per second. 186,282 / 116.66 = 1,596.79 rounded up to 1,597 which is aproximately = 1600 arc cycles of Cevorkum. a harmonic (light-polarization) relationship. 1,596.7941025201 / 1,600 = 0.99799.
the solar system a speed of something like 420,000 MPH. Distance to Polaris (North Star) 434 light years. 200 kilometers per second = 447,387 mph. 2726.90012 x 1596.70285 = 4,354,049.19 years = time of sub-galactic orbit of the solar system around polaris (North Star). Oahspe had a number of 4,700,000 years for sub-galactic orbit around the North Star. 4,354,049.19 / 4,700,000 = 0.92639 or 92.639% accurate. Take into account that in 1881 scientists inaccurately measured the distance to the North Star (Polaris) at only 50 light-years. 4,354,049.19 / 8.68 = 501,618.57 years for sub-galactic orbit of Solar system. 501,618.57 / 4,700,00 = 0.1067 = only 10.67% accuracy. So How did John Ballou Newbrough come up with a number that is 92.6% accurate, when if he had copied the astronomical knowledge at the time he would have came up with a number that was only 10.67% accurate??. It is as if Newbrough was in contact with someone who knew the distance to Polaris was 434 light-years in 1881 instead of 50 light-years. That is impressive. time required for the Solar System to orbit once around the center of the Milky Way Galaxy. Estimates of the length of one orbit range from 225 to 250 million terrestrial years. "time required for the Solar System to orbit once around the center of the Milky Way Galaxy" = range from 225 to 250 million terrestrial years. 225 / 250 = .90 or 90%. 90% is an acceptable range for the galactic orbit, so 92.6% is more than close enough to verify Oahspe's number of 4,700,000 for a sub-galactic orbit arond the North Star (Polaris). Very Impressive, Oahspe is amazing!!. I was testing the mathematical soundness of the Polaris sub-galactic orbit theory. Scientists use mathematics to test theories all the time, such as in string theory, before it is proven to be true. I have already conceded that science has not discovered the sub-galactic orbit. You are stating the obvious about the galactic orbit and what is already known. The question is, is there a sub-galactic orbit that science has at present not discovered yet? Scientific theories are testable and make falsifiable predictions. The defining characteristic of all scientific knowledge, including theories, is the ability to make falsifiable or testable predictions. Theories do not have to be perfectly accurate to be scientifically useful. ...it is incorrect to speak of an assumption as either true or false, since there is no way of proving it to be either (If there were, it would no longer be an assumption). It is better to consider assumptions as either useful or useless, depending on whether deductions made from them corresponded to reality...Since we must start somewhere, we must have assumptions, but at least let us have as few assumptions as possible. Certain assumptions are necessary for all empirical claims (e.g. the assumption that reality exists). However, theories do not generally make assumptions in the conventional sense (statements accepted without evidence). While assumptions are often incorporated during the formation of new theories, these are either supported by evidence (such as from previously existing theories) or the evidence is produced in the course of validating the theory. A theory can be tested for accuracy using mathematics. Theory = the solar system orbits around Polaris (North Star) in 4,700,000 years. Result = unsuccessful attempt to falsify the theory (mathematical test). Just because one is true does not mean the other is false. Our solar-system could be going around BOTH the center of the Milky Way galaxy and Polaris. They are not mutually exclusive, just as the moon goes around the earth while the moon and the earth goes around the sun, or just as the earth goes around the sun while the earth and the sun goes around the galaxy. Just because one is true does not make the other one false. They both can be true. Perhaps it takes the use of modern astronomical equipment and techniques to observe and plot the movement and position of the solar-system in relation to Polaris and the center of the galaxy for hundreds or even thousands of years to know if the solar-system orbits Polaris. It is easy with modern equipment and techniques to see that we are in orbit around the galaxy because astronomers have mapped the size and structure of the galaxy and can see it is spinning and since we are part of the galaxy we obviously are in rotation around the galaxy as it is spinning. website (http://b3ta.com/) that makes a joke about people being so phenomenomally dense, that they may in fact be the centre of a sub-galactic orbit pattern. 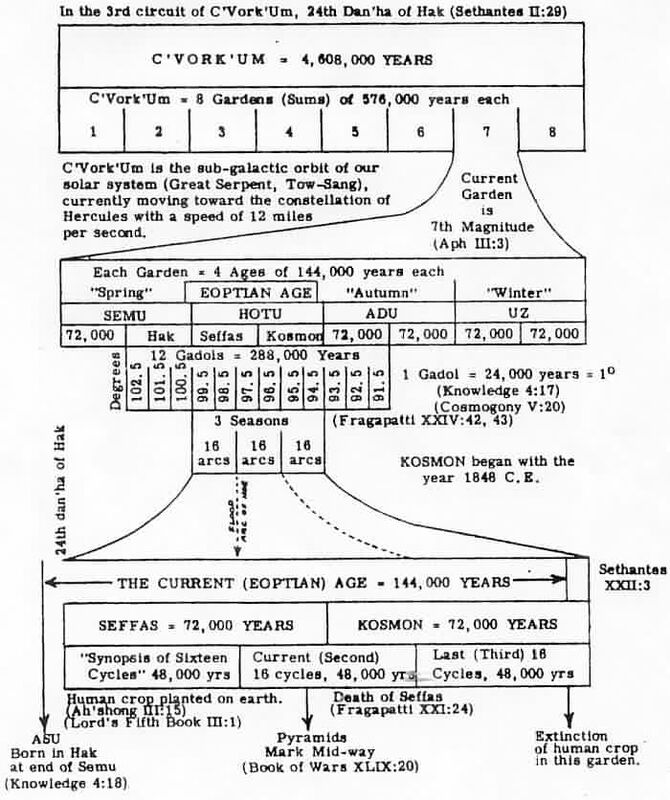 http://www.angelfire.com/ia/faithist/apage5.jpg (uses sub-galactic term in reference to C'Vork'Um near top). http://www.angelfire.com/ia/faithist/apage1.jpg (from Jim Dennon, September, 1979). 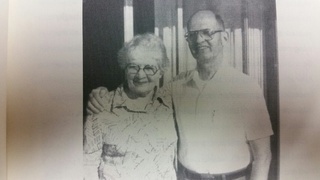 Above: Jim Dennon and his mom. Below is astronomical evidence that the sun is in a sub-galactic orbit around Polaris the North Star. 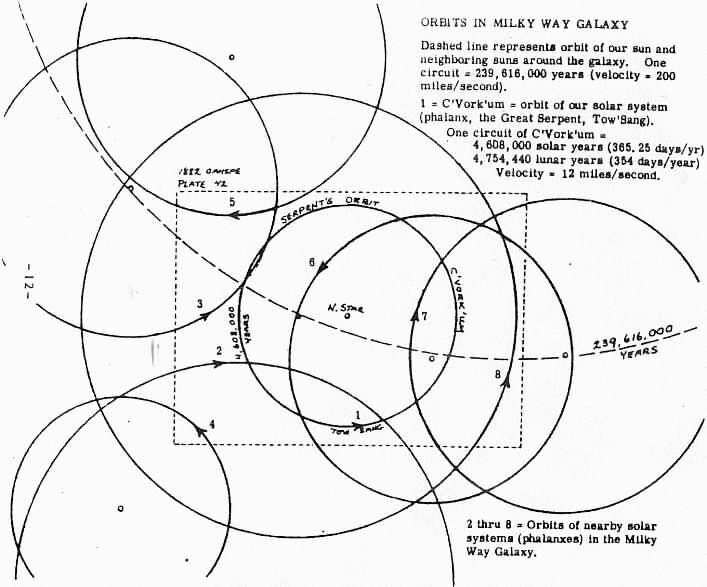 around the galaxy's center = sub-galactic orbits. to Trough = full circle, circumference or orbit (Cervorkum, C'vorkum). The sine wave serpentine like motion is why the solar phalanx is called the great serpent in Oahspe. Picture below shows Polaris (N. Star) just above the galactic plane (--- dashed line) in the center of the sun's orbit (1) above and below the galactic plane. First Realistic Simulation of the the Milky Way. August 25, 2011. Astronomical sky observations and astrophysical simulations have to match up exactly. Simulated Milky Way galaxy after 13 billion of years. 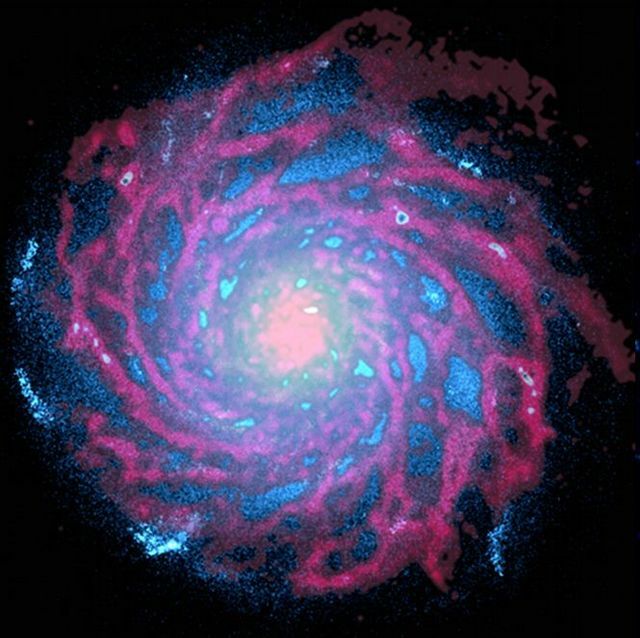 Notice the long spiral arms rotating around center of galaxy. Also notice the elliptical or oval holes inside the spiral arms, I believe these elliptical holes represent sub-galactic vortices (sub-galactic orbits of many solar-systems like our own). The gas clouds are represented in red, [the gas and dust aligns with the vortexian currents, as does the sub-vortices or orbits within the Milky Way galaxy. Our sun and solar system travels along one of the galactic spiral arms as it travels along one of the sub-galactic elliptical curves] the stars are blue. In the center of one of the red ovals is the star Polaris. Above illustration shows galaxy with sub-vortices within it. 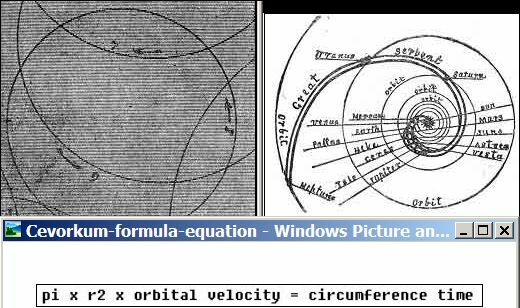 "every vortex contains sub-vortices" - pages 235-236 of THE UNIVERSAL CYCLE THEORY (2011) by Stephen J. Puetz (mathematician, statistician) and Glenn Borchardt, PH.D.(Geology-Geophysics). its motion by an 'epicycle' on top of the mean motion around the Galaxy. a small circle whose center moves around the circumference of a larger one. the circumference of a larger one. Galactic orbit = a larger one. 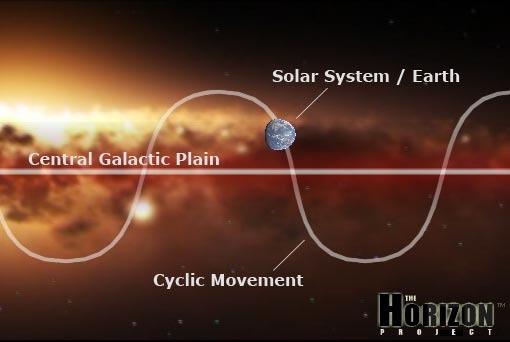 The sub-galactic orbit is just one of many number of cycles within cycles. The sub-galactic orbit is just a cycle (sub-galactic) within a cycle (galactic). In an elliptical orbit r (radius) would be the semi-major axis. The semi-major axis is one half of the major axis, and thus runs from the centre, through a focus, and to the perimeter. Essentially, it is the radius of an orbit at the orbit's two most distant points. For the special case of a circle, the semi-major axis is the radius. The period of a satellite is the time it takes it to make one full orbit around an object. The period of the Earth as it travels around the sun is one year (365.25 days. Oahspe Book of Cosmology and Prophecy: Chapter VII: 17. In orachnebuahgalah the student will...number the earth 1 and 365 [days = 1 year]. If you know the satellite’s speed and the radius at which it orbits, you can figure out its period. Alcyone is one of the main stars of the Pleiades cluster. Its official astronomical designation is Eta Taurus, and it's approximately 407.4 light years away. Some Mayan legends refer to Alcyone as the 'Great Central Sun' around which our solar system would rotate. Guatemala- Cradle of Mayan Civilization [The Cradle of Ongwee-ghan, Native American Indian in Gautama] where the I'hins first landed after the sinking of the continent of Pan in the Pacific ocean. The Maya are well known for their precise calendar and astronomy. The Maya incorporated their astronomical and calendrical data into an intricate, mathematical discipline. The Maya also incorporated mathematically contrived Long Count dates and 'Distance' numbers into their codices and inscriptions, using these and other techniques, the Maya developed mathematical frameworks through which astronomical and calendrical cycles could be viewed as interconnected parts of a grand astronomical order. Over a century of formal scholarly investigations has enabled a fairly broad understanding of the nature of ancient Maya thought processes behind this 'grand astronomical order'. Alcyone, the central star of the Pleiades, is located at 30 degrees from Taurus, near the constellation Orion. In Oahspe the 'Great Central Sun' around which our solar system rotates is Polaris (North Star) the radius or center of Cevorkum at a distance of 434 light-years form earth. 400/434 = 0.921 = 92.1% same distance of Mayan Great Central Sun and Oahspe Great Central Sun. 407.4/433.8 (Google Polaris distance from earth) = 0.939 = 93.9% same distance of Mayan and Oahspean central sun which our solar system orbits around. Above diagram shows the Sun and everything in the solar system in orbit around the North Star Polaris (the radius of the orbit). Below shows the center medium between plus (+) and minus (-) radial velocity doppler shifts close to zero between orbiting object and central radius. Above drawing by John Ballou Newbrough of the central Pole Star in Oahspe plate ILLUSUSTRATIONS OF CORPOREAL WORLDS. Pole star = Polaris. ...pole star usually refers to Polaris, which is the current northern pole star, also known as the North Star. Above is two photo images composited. The base image is the building and the point stars. The star trails are from a CONSIDERABLY longer exposure. Then the two were layered in an image editor. Stars making full circle around polestar = Cevorkum. "the Lords took on corporeal forms and reasoned with mortals; especially on the stars and moon and on the earth; teaching the philosophers the four motions of the earth: axial, oscillaic, orbitic and vorkum; the plan of the hissagow, and the cycles of the earth; the cycles of the sun; and the cycles of the sun's sun; the north star-belt therein, and the vortices that move them all." Polaris center light-years distance (434), the center of Cevorkum, the Master Sun, the Sun's sun. The bright supergiant Polaris with one of its smaller companion stars. Polaris is a white supergiant star with a radius of around 22 million miles (35 million km), which is around fifty times the size of the sun. Polaris is estimated to have a mass of around 4.5 times greater than that of the sun. Polaris has surface temperatures of around 5,700C (10,300F), which is similar to the surface temperature of the sun. Due to its larger surface area Polaris has a luminosity around 2,500 times greater than that of our sun. Cevorkum is a geometric diagram of a circumference (the outer boundary of the roadway, ie. the dashed curve under the letters cevorkum) whose centre is very nearly the North Star hidan sun, sun's sun? 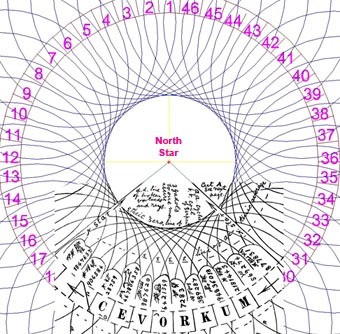 Oahspe gives a diagram of the orbit of the solar system [called Cevorkum] around an area in the direction of the north star, in the Book of Cosmogony. Earth travels with the sun also (revolves around it, in a circuit). 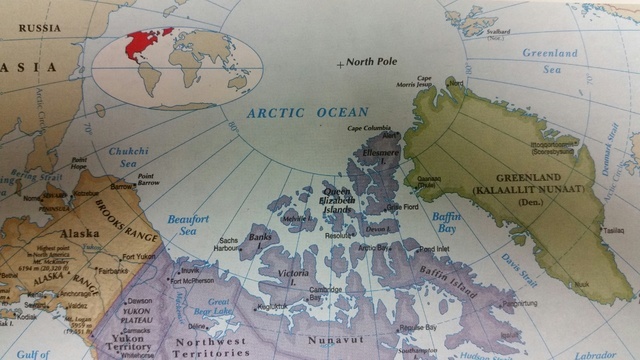 As the Earth rotates on its axis and orbits around the sun, the North Pole continues to point in the same direction in space. All the other stars in the sky appear to move, but Polaris doesn't; it is at one of two points in the sky that remain stationary. The rest of the stars appear to revolve around it. This fixed point is called the Celestial North Pole. It doesn't rise or set, but just sits in the same position at all times. The only reason we can't see it during the day is that the daytime sky is far brighter than the star. The other fixed point in the sky, the Celestial South Pole, is directly above the Earth's South Pole, but there isn't any bright star in that position. Unlike other stars, which appear to rise and set over the course of a night as the Earth rotates, Polaris remains in a fixed position in the northern sky, making it a valuable navigation beacon. 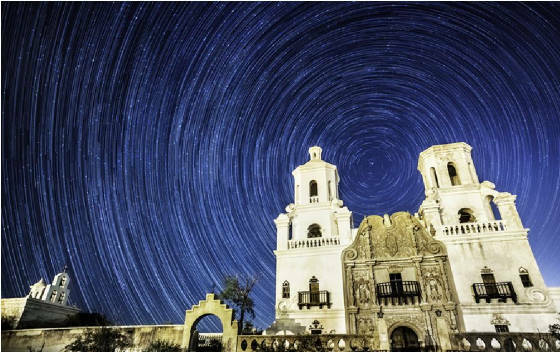 In long-exposure photos, stars in the sky appear to circle Polaris. 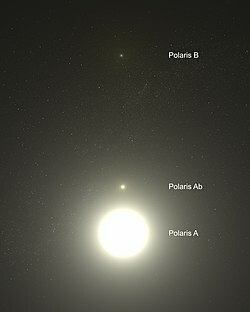 Polaris is actually one of at least three stars in a single system. The star is about 4,000 times as bright as the sun. The circumference of a circle is the length around it. The gap between 3.3 million and 4.7 million may be due to the center of the circuit may be a little farther away than North Star (Polaris and its 2 companions may be orbiting the center of gravity a distace from them) or I used incorrect numbers for the speed of the solar system (see 3 paragraphs below for new calculations). 1220.7 x 2029.46714 = 2477370.5378 = 2 million 477,370 years circuit for sun to go around North Star Polaris. Polaris, the team calculated, was 434 light-years away. But a new study argues that distance measurements of the familiar star made some 2 decades ago by the European Space Agency's venerable Hipparcos satellite are still spot on. Experts appear to agree. Our solar system itself is also moving in an orbit around the galactic core. The solar system is something like 25,000 light years away from the center of the galaxy, and the galaxy makes one rotation every 250 million years or so. That gives the solar system a speed of something like 420,000 MPH. the Sun appears to be cruising along at 200 kilometers per second and it takes 240 million years to complete the grand circuit around the Galaxy. This speed is an absolute speed. 4.4 million is very close to Oahspe's 4.7 million years for the circuit (Cevorkum) of the solar phalanx around the North Star [Polaris - Hidan Sun]. My calculated number of 4.4 million is even closer when you calculate the circuit of the sun based on number of arcs in a circuit = 1,500 x duration of each arc (age or cycle) = 3000 years = 1,500 arcs x 3,000 years = 4,500,000 years = 4.5 million year circuit around the north star which is almost the same as my calculation of 4.4 million years. 1. First, the earth plieth in a circuit around the sun, which circuit is divided into four arcs called spring, summer, autumn and winter. 2. Second, the sun, with his family, plieth in a large circuit, which is divided into one thousand five hundred arcs, the distance of which for each arc is about three thousand years, or one cycle. 3. During a cycle, the earth and her heavens fall in the etherean regions of hundreds of etherean worlds, where dwell Jehovih's high-raised angels, whose Chiefs have to do with the management of worlds. So far modern science has not discovered the Cevorkum, but my calculations show that Oahspe's numbers of 4.5 and 4.7 million are mathematically sound and are in agreement with the scientific measurement of facts (distance of Polaris from our solar system, velocity of our solar system, using formula Circumference = π × diameter = π × 2 × radius). The North Star Polaris is a giant star, with a radius 30 times that of our sun and about 4,000 times as bright as the sun, the sun's sun. My research and calculations solve the mystery of what is the sun's sun, and what is the orbit of our solar phalanx in Oahspe. 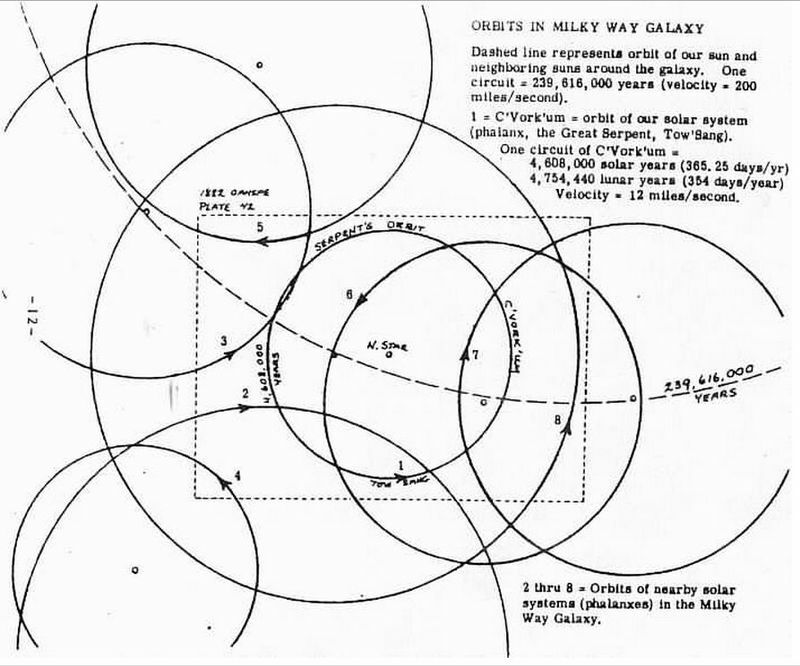 According to Oahspe it is NOT the orbit of the solar system around the center of the Milky Way galaxy but the orbit of the solar system around the North Star. 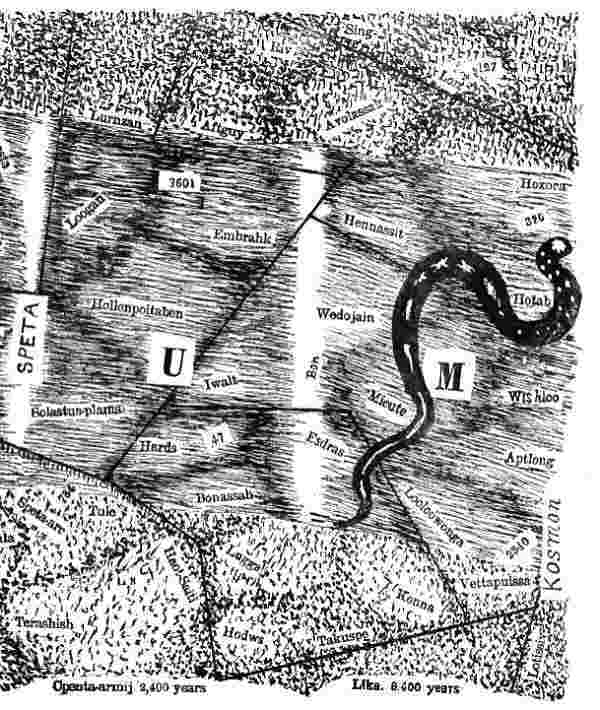 Jim Denim (Removing OAHSPE's Enigma) said of CEVORKUM, also called C'Vork'Um, is the direction (um) of the chief (C') vortex (vork or work), which is the solar system (Great Serpent or Tow'Sang in Oahspe) within the master vortex of the north star. C'Vork'Um is the sub-galactic orbit of our solar system (Great Serpent, Tow-Sang). Jim Denim said our slar system is moving toward the constellation of Hercules at 12 miles per second (43,200 miles per hour). One curcuit of c'vork'um takes about 4,608,000 [4.6 million] years (rounded to 4,700,000 years in Oahspe). On pages 163-164 of The Guinness Book of World Records 1984 edition (The Universe and Space) it says The solar system is revolving around the center of the Milky Way once in each 225,000,000 years, at a speed of 481,000 mph and has a velocity of 42,500 mph relative to stars in our region such as Vega [in the constellation Hercules], toward which it is moving. The 4.5 or 4.7 million year number in Oahspe is amazing because it wasn't possible for man to calculate the sub-galactic orbit of the solar system in 1881 when Oahspe was written because man did not have the knowledge that our sun was in orbit , so the speed of the solar system could not be calculated. Even if they knew the distance to the North Star in 1881, and they calculated r x 2 x Pi = Circumference, without knowing the speed of the solar system around the galaxy they could not arrive at the time in years it would take to complete the circuit or orbit. Some sources say 225 million years galactic orbit, some sources say 250 million years galactic orbit, some sources say 225-250 million years galactic orbit. 481,000 mph (solar system speed) = 225 million years galactic orbit. 420,000 mph = 250 million years galactic orbit. 250/225 = 1.11 = 481/420 = 1.14. 225/250 = 0.90 = 420/481 = 0.87. At the time Oahspe was typed in 1881 the concept of our sun orbiting another sun or star was not in accordance with the astronomical knowledge of the period. Even in the early twentieth century, the prevailing view was that our Sun was the center of not only the Galaxy, but also of the universe. Before and during the time Oahspe was typed, man believed in "the fixed stars" , they didn't believe the stars were in orbits. It wasn't untill 1918 that astronomers discovered that our Sun was not at the center of the Galaxy or universe and was in orbit around the Galaxy. CEVORKUM could not be calculated by man until after 1938, 57 years after Oahspe was typed. Page 84 of the THE CONCISE BOOK OF ASTRONOMY says "Our galaxy is rotating round its central regions, but it does not turn like a solid wheel. [turns like a vortex or whirpool] Stars near the centre make one orbit in only a few million years. [few = at least 3 or 4 million years same as the circuit of Cevorkum in Oahspe]. How is the speed of light measured? The first measurement of c that didn't make use of the heavens was by Armand Fizeau in 1849. He used a beam of light reflected from a mirror 8 km away. The beam was aimed at the teeth of a rapidly spinning wheel. The speed of the wheel was increased until its motion was such that the light's two-way passage coincided with a movement of the wheel's circumference by one tooth. This gave a value for c of 315,000 km/s. Leon Foucault improved on this result a year later using rotating mirrors, which gave the much more accurate value of 298,000 km/s. His technique was good enough to confirm that light travels slower in water than in air. In imperial units this speed is approximately 186,282 miles per second. C indicates the constant speed of polarization in a vacuum. The denser the material the longer (infinitesimal time) it takes to polarize the corporeal needles in solution. Oahspe said "light is polarity of corporeal needles"
"the flash requireth a certain time to polarize these infinitesimal needles...such lapse of time is called the travel of light." The speed of polarization (of corporeal needles in solution). This certain time to polarize the corporeal needles has been accuratly measured and that lapse of time is called the travel or speed of light, the constant c speed of polarization. A light-year is a polarization-year. Sunlight takes about 8 minutes 19 seconds to reach the Earth (based on the average distance). A beam of light is depicted travelling between the Earth and the Moon in the time it takes a light pulse to move between them: 1.255 seconds at their mean orbital (surface-to-surface) distance. The relative sizes and separation of the Earth–Moon system are shown to scale. 33. I have measured the light and computed the time of its coming, |1503| and lo, they have also existed for millions of years. 1 light-year = 5.87849981 × 10 to the 12 miles . light-year = time to polarize infinitesimal needles in solution over a distance of 5.87849981 × 10 to the 12 miles. light-year = time to go from unpolarized darkness or confusion to polarized light, to polarize the adjacent area of space then the next area of space etc...so on for a distance of 5.87849981 × 10 to the 12 miles. Polaris is located at a distance of 434 light-years from Earth and has luminosity nearly 4,000 times that of our sun. 2012 323 ly (99 pc) Turner, et al. 3.^ Jump up to: a b c d e f g Turner; Kovtyukh; Igor Usenko; Gorlova (2012). "The Pulsation Mode of the Cepheid Polaris". arXiv:1211.6103v1 [astro-ph.SR]. Mathematical work showing the distance to the North Star and calculating the speed of our solar system around the galaxy and utilizing the circumference formula pi times radius (distance to North Star) squared to arrive at a grand 4.5 million years circuit that we actually PASS THROUGH (and has a direct impact on us) versus the 25,920 years astrological (precession of the equinoxes) circuit that happened trillions of miles away that does not affect us here on earth (but sometimes may synchronize with C'vorkum arc cycles and sub-cycles and rules of prophecy). The 4.6 or 4.7 million year number in Oahspe is amazing because it wasn't possible for man to calculate the sub-galactic orbit of the solar system in 1881 when Oahspe was written because man did not have the knowledge that our sun was in orbit, so the speed of the solar system could not be calculated. Even if they knew the distance to the North Star in 1881, and they calculated r x 2 x Pi = Circumference, without knowing the speed of the solar system around the galaxy they could not arrive at the time in years it would take to complete the circuit or orbit. 4. Tae said: ...I will find the motion [time and distance] of the Great Serpent (solar system) and this will determine the orbit thereof. C'vorkum Theorum of Oahspe . A rigorous mathematical argument which unequivocally demonstrates the truth of a given proposition. A mathematical statement that has been proven is called a theorem. A theorem is a statement that can be demonstrated to be true by accepted mathematical operations and arguments. 1 What is a Proof? A proof is a method of ascertaining truth. But what constitutes a proof differs among fields. 6.042J/18.062J, Fall ’02: Mathematics for Computer Science. Definition of Proof given 1 minute and 18 seconds into video above. Tom Leighton is a Professor of Applied Mathematics and a member of the Computer Science and Artificial Intelligence Laboratory (CSAIL) at MIT. He received his B.S.E. in Electrical Engineering and Computer Science from Princeton in 1978, and his Ph.D. in Applied Mathematics from MIT in 1981, under the direction of Gary Miller. He joined the MIT Mathematics faculty in 1982, and became Professor in 1989. In 2014 he was elected to the Massachusetts Academy of Sciences. Computer science is very important in mathematics because computers can calculate numbers much larger than man can and can calculate numbers much faster than man can. Mr. Liebniz believed that it did not make sense for men to spend hours and hours doing mathematical calculations when he could invent a machine that would work much faster. Gottfried Wilhelm (von) Leibniz (/ˈlaɪbnɪts/; German: [ˈɡɔtfʁiːt ˈvɪlhɛlm fɔn ˈlaɪbnɪts] or[ˈlaɪpnɪts]; French: Godefroi Guillaume Leibnitz; July 1, 1646 – November 14, 1716) was a German polymath and philosopher who occupies a prominent place in the history of mathematics and the history of philosophy. Scholars including Bertrand Russell believe Leibniz developed calculus independently of Isaac Newton, and Leibniz's notation has been widely used ever since it was published. It was only in the 20th century that his Law of Continuity and Transcendental Law of Homogeneity found mathematical implementation (by means of non-standard analysis). He became one of the most prolific inventors in the field of mechanical calculators. While working on adding automatic multiplication and division to Pascal's calculator, he was the first to describe a pinwheel calculator in 1685 and invented the Leibniz wheel, used in the arithmometer, the first mass-produced mechanical calculator. He also refined the binary number system, which is the foundation of virtually all digital computers. 2726.90012 x 1220.7 (x faster light vs solar system) = 3328726.97648 = 3 million 328,726 years circuit around north star (Polaris). 4.4 million is very close to Oahspe's 4.5 to 4.7 million. (an age or cycle can vary 2,400 to 3,600 years, so a circuit or C'VORKUM can vary 100 to 300 thousand years). CV = Pdx2 + SGS = 4.4 million years. 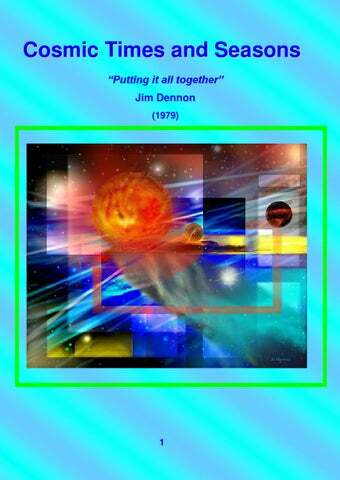 According to Oahspe scholar Jim Dennon C'Vork'um is 4.6 million years (4,608,000 years). 5.41 to 7.26 percent is an acceptable margin of error or variation over such an enormous (4.5 million years) period of time. 12:17 to 12:25 "a measurement is meaningless without knowledge of the uncertainty in your measurement"
Like confidence intervals, the margin of error can be defined for any desired confidence level, but usually a level of 90%, 95% or 99% is chosen (typically 95%). This level is the probability that a margin of error around the reported percentage would include the "true" percentage. Yet even in the early twentieth century, the prevailing view was that our Sun was the center of not only the Galaxy, but also of the universe. Harlow Shapley (November 2, 1885 – October 20, 1972) was an American astronomer. It wasn't until 1918 that astronomers discovered that our Sun was not at the center of the Galaxy or universe and was in orbit around the Galaxy. CEVORKUM could not be calculated by man until after 1918, 37 years after Oahspe was typed. First calculated speed of the solar system I could find was 1978 (86 years after Oahspe). The Sun's orbit around the Galaxy is expected to be roughly elliptical with the addition of perturbations due to the Galactic spiral arms and non-uniform mass distributions. The difference between my calculated time of C'vorkum vs the number in Oahspe is probably due to the difference between an elliptical orbit vs a circle. "In a circular orbit, the speed is the same all the way round, but in an elliptical orbit, the speed is NOT the same at perigee and apogee (those are the points of maximum and minimum speed)". The Earth travels around the sun in an ellipse. If the Earth were to orbit the sun in a circle, the Earth's speed around the sun would be constant. We can think of this as the Earth's average speed. However, because the Earth's orbit is elliptical, the speed of the Earth varies throughout the year. The speed of the Earth is fastest when it is closest to the sun, in January, and slowest when it is farthest away from the sun, in July. In other words, in January it will be moving faster than average, and in July it will be moving slower than average. The difference in speed of an elliptical orbit vs a circular orbit is proportional to the difference in distance at aphelion and perihelion. 00.98329 / 1.0167 = 0.96713878233 . I guessed (without actually looking it up until many months later) from my own insight that "the difference in maximum and minimum speed of an elliptical orbit is proportional to the difference in distance at aphelion and perihelion" and "the difference in speed of an elliptical orbit vs a circular orbit is proportional to the difference in distance at aphelion and perihelion". My guess proved to be exactly correct (see below) out to 4 decimal places (ten thousandths of 1 percent). This guess may be a law similar or the same as Kepler's Laws of planetary motion. The period of a planet’s orbit squared is proportional to its average distance from the sun cubed. ec·cen·tric·i·ty; deviation of a curve or orbit from circularity. Relation of orbital speed and eccentricity. Is this a coincidence or are the variations of speed directly related to eccentricity? No it's not a coincidence. Kepler's second law: A line joining a planet and the Sun sweeps out equal areas during equal intervals of time. The swept area is proportional to the distance times the orbital velocity: dA = dt∗v∗r/2 = const dA = dt∗v∗r/2 = const. This makes the product of velocity and distance from the sun a constant. 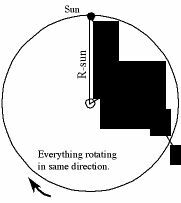 Rotational speed in the earth's orbit around the sun does vary according to our position in that orbit. The planet moves faster when it is closer to the sun. 105,448 / 109,033 = 0.9671200462. 4,359,047.23109 / 4,545,552.27695 = 0.9589 = 95.89% same . 4,359,047.23109 / 4,456,575.50898 = 0.9781 = 97.81% same . The remaining 2.19% or 4.11% could be "perturbations due to the Galactic spiral arms and non-uniform mass distributions". 2.19% and 4.11% are within the 95% margin of error. This lecture is part of 8.01 Physics I: Classical Mechanics, as taught in Fall 1999 by Dr. Walter Lewin at MIT. From 2 minutes 19 seconds into video to 7 minutes 13 seconds. I have introduced a new word to the english and scientific lexicon, the new word is POLARIOCENTRIC. No results containing all your search terms were found. Your search - POLARIOCENTRIC - did not match any documents. The Oahspe system of Astrology (or Cosmogony) is Polariocentric because it accepts the true position of Polaris (the north Star) as the center and master of the solar orbit and provides a mode of interpretation, that can be verified mathematically and astronomically. - page 144 of SEVEN YEARS THAT CHANGED THE WORLD, 1941-1948 (1940) by Wing Anderson. I replaced the word HELIOCENTRIC with POLARIOCENTRIC. Wing Anderson said "can be verified mathematically and astronomically", I have done this (mathematically and and astronomically) with C'vorkum (mathematical proof). Not Helio-centric but Polaris-centric 434 light-years as the center of a C'vorkum circle (circuit, orbit). 26,666 x 2 x 3.1415926 = 167,547.4165 light-years around galaxy. Some sources say 225 million years galactic orbit, some sources say 250 million years galactic orbit, some sources say 225-250 million years galactic orbit. 550,000 divided by 420,000 = 1.30952380952 x 204,525,111 accounts for 250 million years plus galactic orbit. 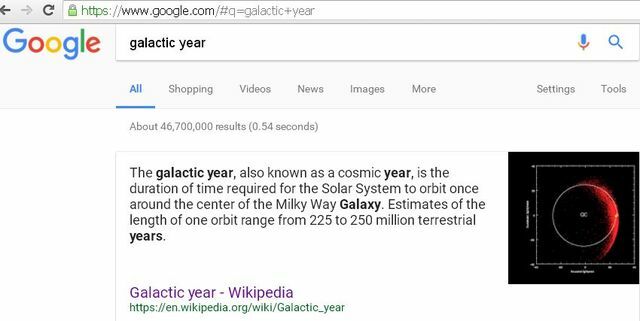 550,000 divided by 447,387 = 1.22936071 x 204,525,111 = 251,435,135 (251 million years) galactic orbit of earth and solar system. 1503 i.e., computed how long it took the light to "travel" from star(s) to the earth. What is being measured as the speed of light is actually an EFFECT (or process) of light, not light itself. The effect of the subatomic needles polarizing = lapse of time and travel of light. Earth scientists ability to calculate the distance to the sun and stars and planets has greatly improved (much more accurate) since the time Oahspe was published. Since 1915 and Einstein earth scientists know about the curved path of light in space that was not known as the time Oahspe (Book of Cosmogony and Prophecy chapter 6 :1,2) was published (1881). This article documents the farthest known astronomical objects, and the time periods in which they were so classified. 1 List of the most distant astronomical objects . 3 Timeline of most distant astronomical object recordholders . (this is very inaccurate) This number is wrong; originally announced in 1891, the figure was corrected in 1910 to 40 ly (60 mas). 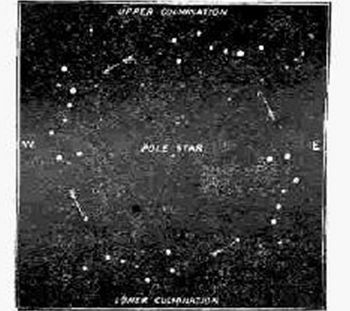 From 1891 to 1910, it had been thought this was the star with the smallest known parallax, hence the most distant star whose distance was known. Prior to 1891, Arcturus had previously been recorded of having a parallax of 127 mas. At the time of Oahspe (1881) the most distant star or stars that man had measured in light-years was the star Capella (Alpha Aurigae) at only 72 light-years. So the concept and science of measuring the distance to stars millions of light-years away was far ahead of the time of 1881. At the time of Oahspe (1881) man thought that Polaris was only 50 light-years away instead of the correct number of 434 light-years away. If Newbough had used the 50 light-years distance to Polaris (the radius of Cevorkum) he would not have been able to come anywhere near the 4.7 million years number for the Cevorkum circuit of the sub-galactic orbit of the solar system. 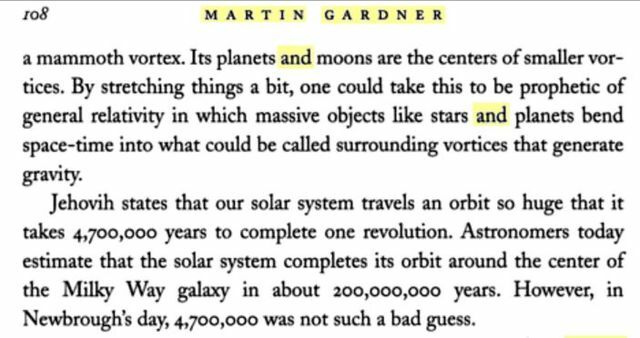 There is no way Newbrough could have came up with the 4.7 million years number (which is within 5 to 7% accurate according to modern astronomy and math) for the sub-galactic orbit around Polaris (using pi x radius x 2 + speed of solar system around galaxy). This is more evidence that Newbrough was in contact with a source that was far ahead of the knowledge of man on earth. 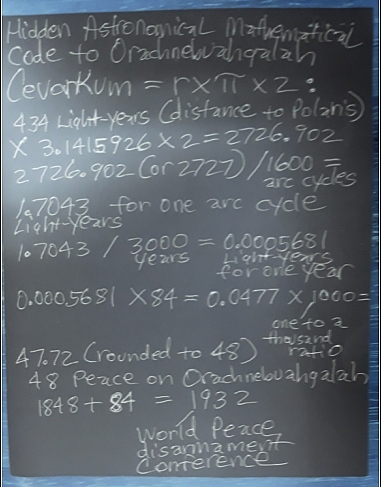 Using the 1881 math and science for the distance to Polaris (50 ly) Newbrough would have came up with a C'vorkum circuit number of approximately 502,300 years or 541,470 years by Oahspe's number. Both numbers are way off. It is as if Newbrough was in contact with someone who knew the distance to Polaris was 434 light-years in 1881 instead of 50 light-years. As shown above and stated below the sun and the solar system is moving toward the star Vega in the constellation of Hercules at the solar apex. Polaris is the raidus (434 light years distant). The north pole of the earth is in line with Polaris now, near (just beyond) the solar apex, the solar system (including earth), Vega, and Polaris will line up. Radius: a line segment joining the centre of the circle to any point on the circle itself. The Apex of the Sun’s Way, or the solar apex, refers to the direction that the Sun travels through space. The radioastronomical position of the solar apex is given as Ra= 18:03:50.2 Dec = 30:0:16.8. The direction of the solar apex is southwest of the star Vega near the constellation of Hercules (shown above). 1,500 arcs x 3,000 years = 4,500,000 years or 4.5 million years. 2. And Jehovih caused the earth, and the family of the sun to travel in an orbit, the circuit of which requireth of them four million seven hundred thousand years. (C'VORKUM, 4.7 million years). If I knew that Polaris was the same distance away from the earth (434 light-years) when the sun reaches solar apex then that would be evidence of Polaris being the central radius of the solar system's cicuit or orbit around it, I don't have that data (distance of Polaris from Vega or the solar apex), but redshift data or radial velocity (Doppler shift of spectral lines) would give me the same type of information. A variable relatively low number either away or from the earth would indicate a relative same distance or fixed central postition like the radius of a circle. The radial velocity of Barnard's Star towards the Sun can be measured by its blue shift. Radial velocity = Doppler shift of spectral lines. Doppler spectroscopy also known as the radial velocity. The radial velocity of Vega is the component of this star's motion along the line-of-sight to the Earth. Movement away from the Earth will cause the light from Vega to shift to a lower frequency (toward the red), or to a higher frequency (toward the blue) if the motionis toward the Earth. Thus the velocity can be measured from the amount of redshift (or blueshift) of the star's spectrum. Precise measurements of this redshift give a value of −13.9 ± 0.9 km/s. The minus sign indicates a relative motion toward the Earth. 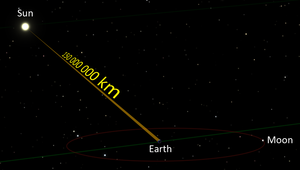 Vega has a low radial velocity in relation to the earth, but the solar system is moving toward Vega instead of around it so Vega could not be in a relative fixed or central position to the earth. Polaris has a low radial velocity away from and toward the earth ranging from + 2 (2.080 ± 0.042 km s–1) to - 17 (-17 km/s) which may indicate a central fixed position in relation to the earth (solar system)or it could just be traveling with the earth around the galaxy without being the radius of a orbit. lower frequencies. This could be due to either instrumental drift or long-period variation intrinsic to Polaris, which we discuss in § 5. A few radial velocity campaigns have claimed the presence of additional long-period variations in Polaris. In the WIRE data we find evidence of low-amplitude variation (peak-to-peak 2 mmag) at timescales of 2-6 days, which are likely intrinsic to Polaris. Since last July, the Earth has been falling ever closer to the Sun. Every moment since then, our planet has edged closer to the nearest star in the Universe, approaching it at over 1100 kilometers per hour, 27,500 km/day, 800,000 km every month. But don’t panic! We do this every year. And that part of it ends today anyway. The Earth’s orbit around the Sun is not a perfect circle. It’s actually an ellipse, so sometimes we’re closer to the Sun, and sometimes farther away. Various factors change the exact date and time every year — you can get the numbers at the Naval Observatory site — but aphelion (when we’re farthest from the Sun) happens in July, and perihelion (when we’re closest) in January. The Moon has an perigee and apogee as it ravels around the earth, the sun has a perihelion and aphelion as the earth travels around it, and Polaris has a aphelion and perihelion (Doppler shift) as the solar system travels with it. The strongest evidence (stronger than arc or direction of solar travel toward Vega in Hercules, radial velocity, or Doppler shift of spectral lines) to support Oahspe's C'Vorkum figures of 4.5 to 4.7 million years is my calculated number of 4.4 million years based on measured light-year distance to Polaris, measured speed of solar system around the galaxy, and the formula Circumference = π × diameter = π × radius x 2. Cosmic knowledge. Above drawing in Oahspe. Roadway of Solar Phalanx (Solar System) Plate. The figure of the Serpent represents the Solar Phalanx (Solar System), it shows the Solar system traveling at about a 60 degree tilt in its sub-galactic orbit (C'vorkum). Okay, our solar system is traveling through space, orbiting our own galaxy, but how are we tilted? Are we moving sideways through our galaxy? At a 45 degree slant? Straight "up?" Straight, "down?" 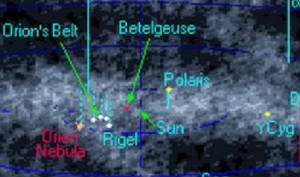 The plane of our Solar System is at about a 60 degree angle to the galactic plane. The Sun and planets of the Solar System. The solar system tilted, and the milky way galaxy. Note: SUPERimposed not to scale. Plate 49.--Cevorkum, roadway of solar phalanx. a, a, a, lines of different currents; b, b, b, transverse currents. The crossing denote the localities of the highest etherean light. The numbers with their signatures, show the densities through which the great serpent passes each cycle. The lines across the cevorkum denote a cycle of three thousand years, but overdrawn one thousand times in order to be apparent to the eye, i.e., one to 4,700,000. The plate above shows the North Star (--->N. Star) as the center of Cevorkum. 1882 Green Oahspe plate 49.--Cevorkum, roadway of solar phalanx. 4.4 million is very close to Oahspe's 4.7 million years for the circuit (Cevorkum) of the solar phalanx around the North Star [Polaris - Hidan Sun]. 4,365,603.35606 very close to the calculated 4,359,047.23109 (see Extrasolar planets, CEVORKUM, Light speed chapter, 2/5 down from top). 4,359,047.23109 / 4,365,603.35606 = 0.99849823164 percent same. Highest Cevorkum density / lowest prophetic number = Cosmogony / prophecy = Cevorkum orbit. Highest Cevorkum density / lowest prophetic number = Space / Time = Cevorkum orbit. 12 cycles = 36,000 years. 5 cycles span from highest density to next highest density = 15,000 years = 2.4 oscillations or cycles per 36,000 years (12 cycles). This is almost identical to the ratio of 21.6 year average span from highest upspike to lowest downspike in 50 year periods = 2.31 (50 / 21.6) or 2.38 (50 / 21). Total spans of highest to lowest density, next highest to next lowest density = 21. Average or mean span between highest and lowest densities, and next highest to next lowest densities = 21 / 4 = 5.25. 5.25 x 3000 (years) = 15,750. 36,000 / 15,750 = 2.28 (rounded to nearest 2.3). 12 cycles = 36,000 years. Average or mean 5.25 cycles span from highest density (a'ji) to lowest density (dan), and next highest density to next lowest density = 15,750 years = 2.3 oscillations per 36,000 years (12 cycles). This is almost identical to the ratio of 21.6 year average span from highest upspike to lowest downspike in 10 50-year periods = 2.31 (50 / 21.6). There is a pattern (periodicity) there in the Cevorkum plate 49 densities that matches the climate (heat, cold) cycles of earth. Same (harmony) average or mean on solar system and galactic scale as the planetary scale. 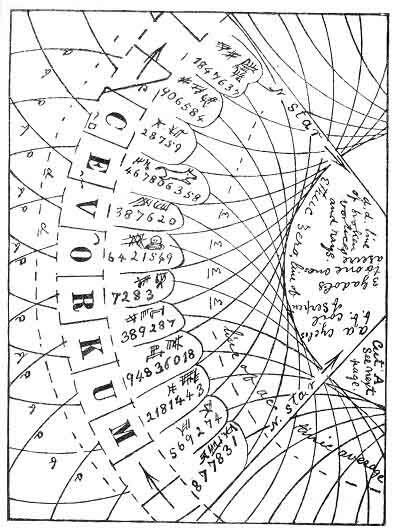 Our Solar System’s Serpent like wave motion through the galaxy, Drawn in 1881, in OAHSPE. Above (middle picture) is The Path of the Solar Serpent’s Vortex drawn in 1881 by John Ballou Newbrough from OAHSPE plate 36 shows the movement of our solar system through galactic space. Plate 71.--A, A, road of travel of the vortex. Tow'-Sang, or solar family of the Great Serpent. B, B, deviation from a straight line. (See plate 46). C, C, C, C, vortices of other systems of worlds. D, D, D, D, dan, dan, dan, dan; that is, from D to D, is three thousand years. The open space in the curve B, B, near the centre of the plate, indicates the place of the serpent in this day. 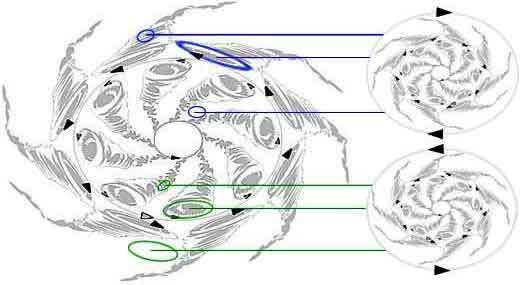 Above drawing by John Newbrough in Oahspe shows the solar family of the Great Serpent (our solar system) deviating from a straight line (moving in a wave-like snake motion) in it's orbit. Our Solar System’s wave like course above and below the Ecliptic plane of our Galaxy. The entire Solar System moves in a vortical trajectory like a snake moving in 3 dimensions instead of a flat plane. 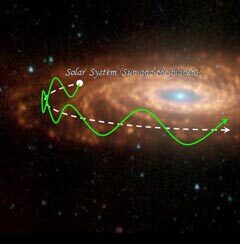 The entire Solar System is moving like a snake above and below the galactic ecliptic in spiraling helical motions. 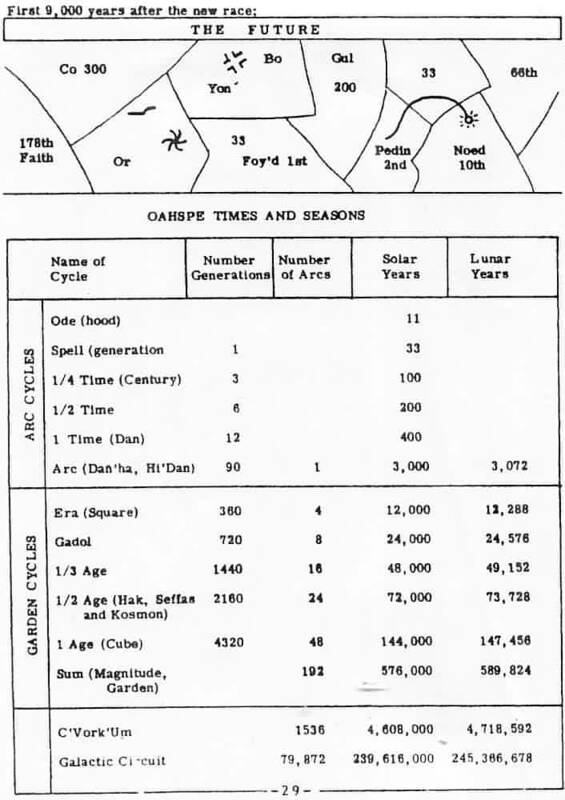 At the time Oahspe was typed in 1881 the concept of our sun orbiting another sun or star was not in accordance with the astronomical knowledge of the period. Even in the early twentieth century, the prevailing view was that our Sun was the center of not only the Galaxy, but also of the universe. In a brilliant intellectual leap, Shapley realized that this 30-kpc-wide distribution of globular clusters maps out the true extent of stars in the Milky Way Galaxy--the region that we now call the Galactic halo. The hub of this vast collection of matter, about 8 kpc from the Sun, is the Galactic center. As illustrated in Figure 23.9, we live in the suburbs of this truly huge ensemble of matter, in the Galactic disk (or Galactic plane)--the thin sheet of young stars, gas, and dust that cuts through the center of the halo. Shapley's bold interpretation of the globular clusters as defining the overall distribution of stars in our Galaxy was an enormous step forward in human understanding of our place in the universe. Five hundred years ago, Earth was considered the center of all things. Copernicus argued otherwise, demoting our planet to an undistinguished place removed from the center of the solar system. Yet even in the early twentieth century, the prevailing view was that our Sun was the center of not only the Galaxy, but also of the universe. He is notable for his groundbreaking 1918 work using Cepheid variables to estimate the size of the Milky Way Galaxy and the sun's position within it. It wasn't until after 1918 that scientists were able to know the movement of the Sun around the galaxy. And what they discovered was the sun moves in a sepent or snake like motion just as Oashpe depicted in 1881. If you find this information helpful to you please feel free to make a $20 dollar donation and help support my research. Thank You. If you want to donate more than $20 enter the amount here. Thank you for supporting my work. With a $20 or more donation I am also avaliable for a 30 minute phone consultation where I will answer questions you may have. Email me or leave a comment if you want a phone consultation.